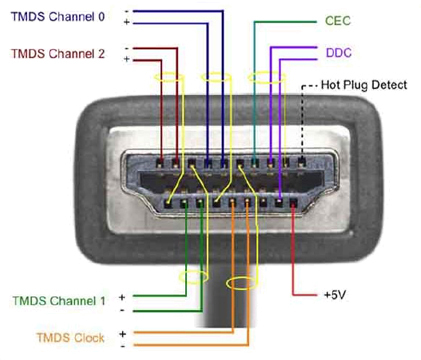 Pins 1 through 9 carry the three TMDS data channels (Transition Minimized Differential Signaling – the technology that allows DVI and HDMI to send high-speed digital data), three pins per channel. TMDS data includes both video and audio information, and each channel has three separate lines for + values, - values, and a ground or data shield. Pins 10 through 12 carry data for the TMDS clock channel, which helps keep the signals in synchronization. As with the TMDS data channels, there are separate lines for + values, - values, and a data shield. Pin 13 is carries the CEC (Consumer Electronics Control) channel, used for sending command and control data between connected devices.